On the first day of Christmas, Walkley Chiropractic gave to you…pain free mobility to reach up and put your star on the top of the tree! Pain free mobility and sports performance is very easy to take for granted until you are suffering pain from an injury or overuse. Our chiropractors not only treat these injuries, but we will also devise a programme of exercises to give you the best chance of preventing the injury reoccurring. The run up to Christmas can be a stressful time and if you suffer from headaches or migraines, you don’t want them stopping you in your tracks. At Walkley Chiropractic, we can assist in treating the pain as well as assisting with prevention in the future. On the third day of Christmas, Walkley Chiropractic gave to you…a reduction in chronic back pain. Back pain is something many people will experience over the course of their lives. Using chiropractic care is a safe, natural and drug-free way to relieve back pain, resulting in greater flexibility and range of motion. People in less pain sleep better. While chiropractors generally aren’t thought of as being experts on sleep issues, one-third of people who have a chiropractic adjustment report that they experience immediate sleep improvement. And, adults are not the only ones to benefit, it is well documented that children have far more restful sleeps after a visit to the Chiropractor. On the fifth day of Christmas, Walkley Chiropractic gave to you… a more comfortable pregnancy. On the sixth day of Christmas, Walkley Chiropractic gave to you… a healthier immune system. At Walkley Chiropractic, we focus on improving the health of your musculoskeletal system. A healthy spine is an integral part of that system. A spine that is aligned and moving correctly helps your whole body work better, including your immune system. On the seventh day of Christmas, Walkley Chiropractic gave to you… more energy. Everyone could use a little more energy and just what you need in the run up to Christmas! When your body is working optimally, you feel better and have more energy to do the things you enjoy. On the eighth day of Christmas, Walkley Chiropractic gave to you… improved digestion. Many of us tend to overindulge over the festive season. Our digestive system can be challenged throughout this period but regular chiropractic care can result in an overall improvement to your digestive system resulting in feeling more comfortable after eating. Christmas shopping can be intense and it can be made worse if you have sore feet. The Plantar Fascia maintains the arch of the foot and acts as ones of the body’s shock absorbers. When micro tears occur, in can be incredibly painful. When chiropractors improve body alignment, they improve foot biomechanics as well. Couple this with the right footwear and you can eliminate symptoms quite effectively and make your Christmas shopping experience much more pleasant. Christmas tends to be a super busy time of year and we often have multiple things going on in our heads at once. The brain is the master control system of the body. It sends and receives complicated signals that dictate how the body works. When there is interference in this neurological feedback loop it can alter the movement and function throughout the body. Regular chiropractic care helps restore normal brain/body signalling and function. 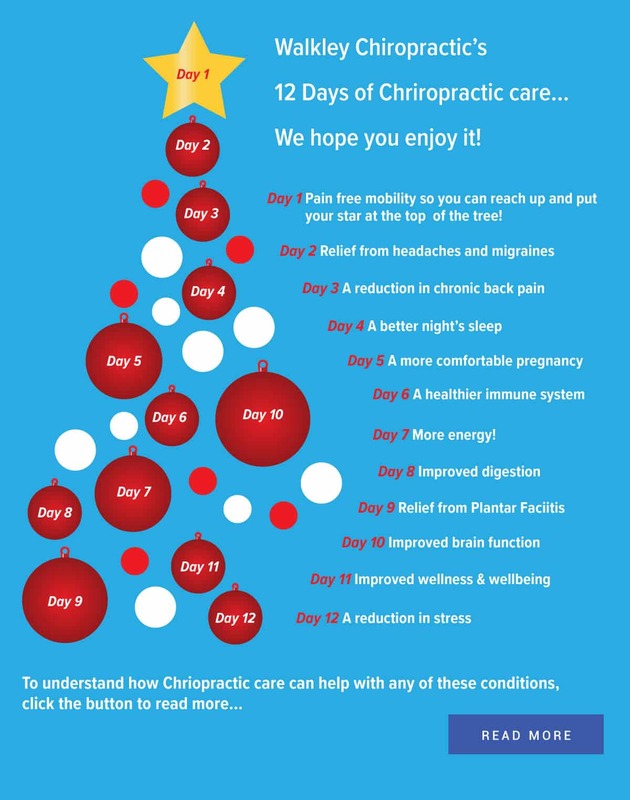 On the eleventh day of chiropractic, Walkley Chiropractic gave to you… improved wellness & wellbeing. Imbalances in your spine can cause inflammation and irritation, which can cause problems with the communication between your central nervous system and the rest of your body. When normal communication is restored, your body can function as it was meant to and heal itself. That is why chiropractors are really doctors of wellbeing, because the adjustments they make to your spine has positive effects on your entire body. On the twelfth day of chiropractic, Walkley Chiropractic gave to you… a reduction of stress. Just what you need before the in-laws arrive! Chiropractic care has been found to be helpful in assisting patients manage their stress levels and become relaxed. Rounded treatment plans which help manage pain (resulting in reducing stress) leading to better sleep patterns (also reducing stress) can help with overall mental wellbeing. Wishing all our patients a happy and safe Christmas!